HomeNewsGlobal Rhythms Closing Weekend Sensation 2016 Sydney Fringe Festival! Global Rhythms Closing Weekend Sensation 2016 Sydney Fringe Festival! 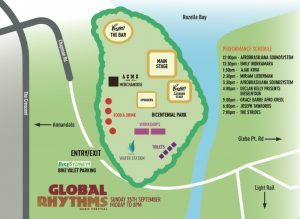 With a line up that’s the envy of independent self-funded music festivals around Australia, Global Rhythms is set to be the closing weekend sensation of the 2016 Sydney Fringe Festival! “Back in 2013 when we last hosted Global Rhythms the feedback we got was that the line up needed more women. Now, in 2016 with Emily Wurramara, Ajak Kwai, Gamibirra, Grace Barbé and the Miriam Lieberman Trio we’ve shown that we listen!” says Festival Director Tony Smythe. Special MC for the day will also be Canadian Haitian singer and Queen Kafé presenter Stéphanie Denizard aka Athésia.